Earlier this month we hit a milestone in our house. 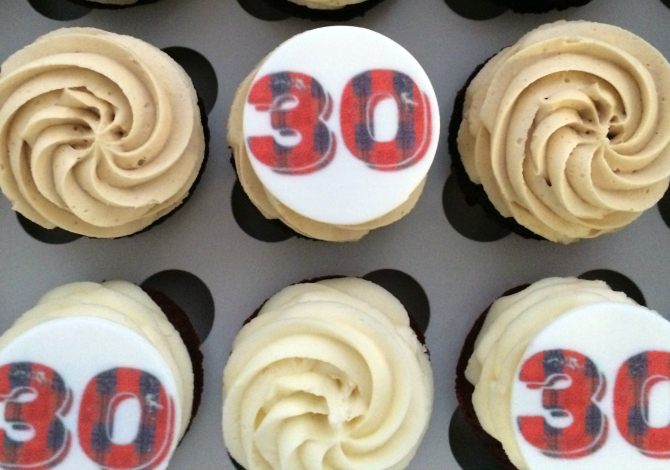 My husband turned the BIG 3-0. 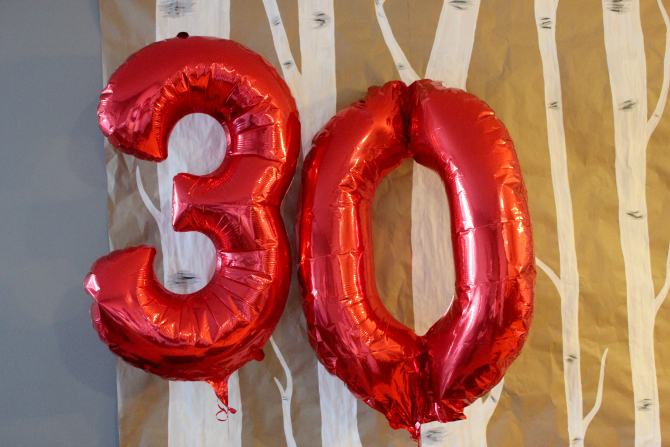 But, this post isn't about how he entered the 3rd decade slightly before me, or how he'll be 30 when Baby Wardo enters the world, or even how many gray hairs he has. 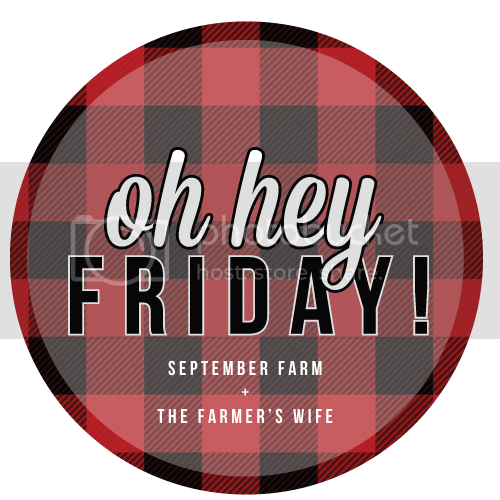 No, this post is about the wicked awesome party I threw to celebrate. During our hockey years, I loved planning get togethers. From girls nights to dinner parties and showers to holiday feasts, bringing together good food, good drinks and, most importantly, good company, was my happy place. It's safe to say party planning has been missing from my life the past few years. So, despite being 34 weeks pregnant, I jumped on the opportunity to celebrate my other half. 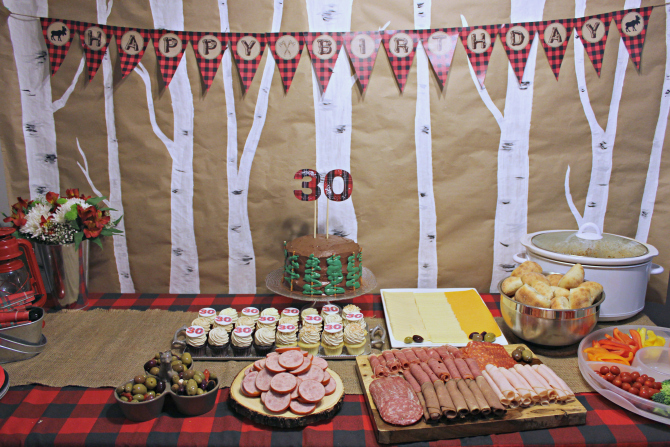 Being the outdoorsman that he is, I knew I wanted to throw an appropriately themed party. 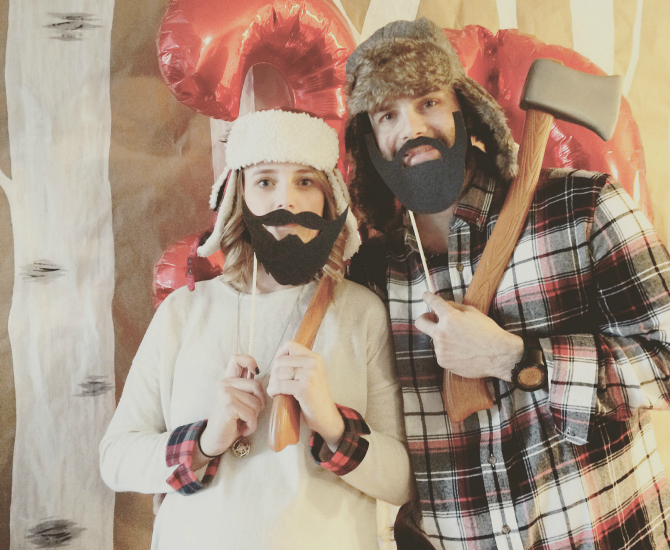 And so naturally, I dove head first into Pinterest, searching all things 'Lumberjack Bash'. I'll admit, most of the things that popped up did have to do with a one year old's birthday party, but that's not what's important here. The important thing is that it rocked, and I have totally not lost my party planning mojo. Because who doesn't love an excuse to throw on some silly props and strike a pose?! 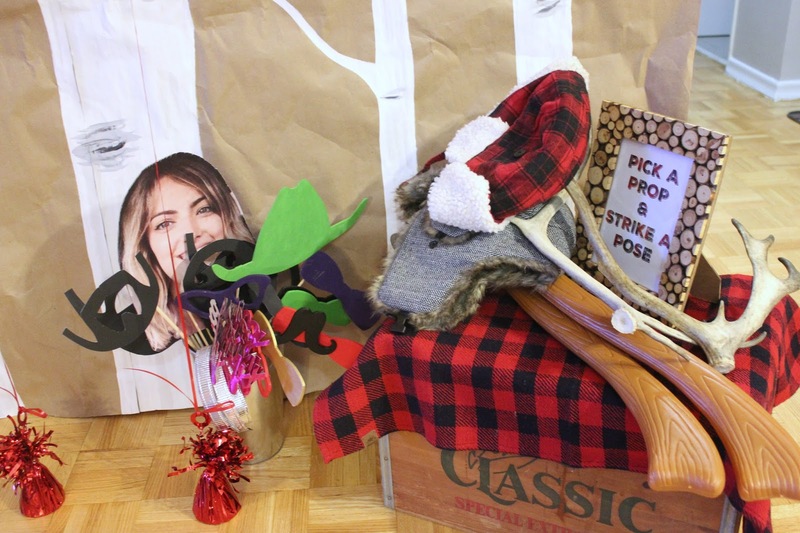 Props includes (plastic) axes, fake beards and moustaches, outdoorsman hats and more! The backdrop was a very appropriate birch tree forest, painted by yours truly. And if you're wondering why there's a giant head cutout in there, that's my sister. Living half way across the country she misses out on a lot of get togethers, so we always make sure to include her. 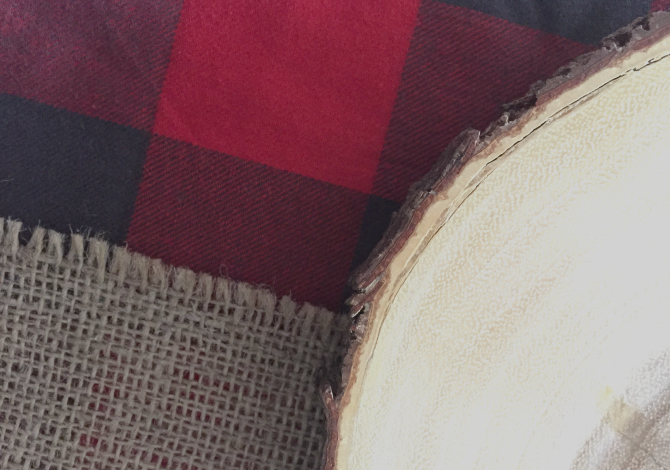 Plaid, burlap, wood and more plaid. The decor even came down to the smell - with a woodfire-scented candle from Indigo. 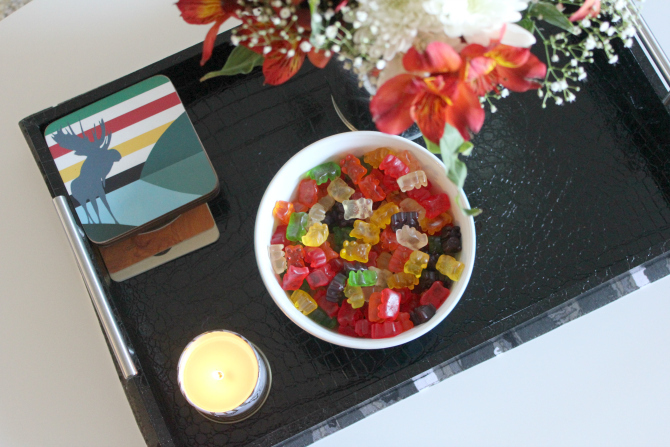 Also included were gummy bears, or 'grizzly bears' to go along with the theme, these cute moose coasters from Hudson's Bay (a Christmas gift to my husband) and an added girly touch, fresh flowers (in manly colours of course). Food was a high priority, as it is at any party thrown by Casa Ward. We had meat and cheese platters ("man food"), pulled pork sandwiches and a whole lot of other "outdoorsy-ish" food. Including sushi, because this 34 week preggo craved some veggie sushi. Oh and this pasta salad. 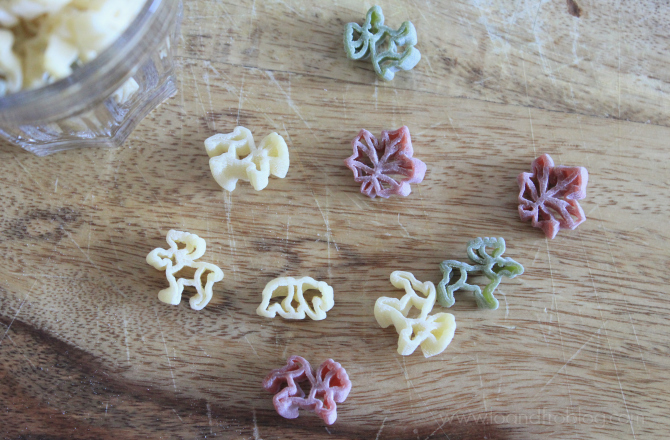 How stinkin' cute are these noodles? With over a decade of S Ward's birthdays under my belt, I no longer have to ask what he wants for his birthday dinner or dessert. It's always the same - rainbow chip cake with vanilla icing. Seeing as it was a lumberjack theme, I decided to sub the white icing for chocolate and tried to make the cake look more like a log. 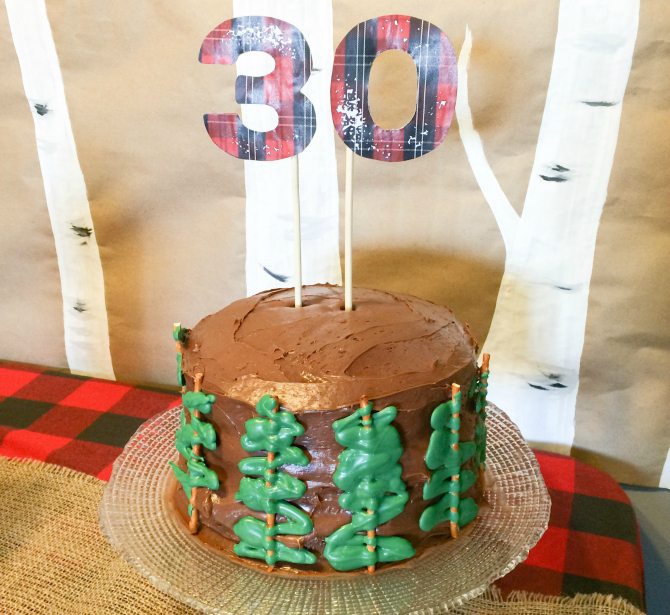 The cake topper was made in PicMonkey and "evergreen trees" were melted green chocolate wafers drizzled over pretzel sticks. And because I didn't think that one cake would be enough, I also ordered these adorable mini cupcakes from a local bakery. I sent them the jpeg file of the cake topper and they were able to customize the cupcake toppers to fit the theme. Our tiny abode was jammed with (maybe too many) people and we may have kept the neighbours up until 2am, but we definitely had some good laughs. 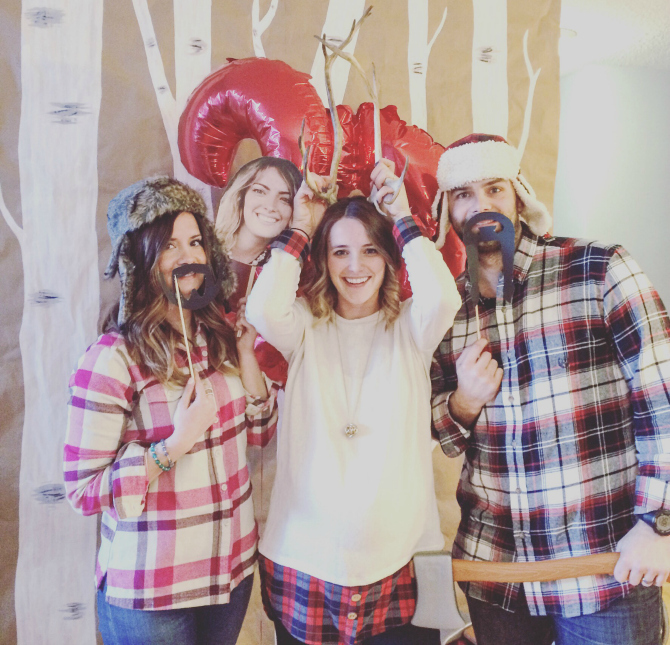 Plaid was "strongly encouraged" and it was impressive to see everyone show up in the best lumberjack gear. While I may not be quitting my day job to become a party planner, I am so glad that our friends and family could get together to celebrate my outdoorsman, especially before our mini outdoors-person comes along and steals his thunder. Do you enjoy party planning? What is your favourite type of theme party?